How do I love thee? Let me count the square feet. Welcome to the week of love. At Zentila, we’re all into the love thing. We have a core value dedicated to it – Love and be Loved – and even have it in our phone number (it's 407-656-LOVE. Don’t believe us? Go ahead and call. We’d love to talk with you.). But what exactly does the hotel look at to best judge whether your meeting is the best match for them or not? Besides driving occupancy and room rate, there are other factors that you should understand to best position your meeting for the LOVE it so well deserves. Let’s head back to the revmax form and talk about one key measurement: The Space-to-Rooms Ratio. Space-to-Rooms Ratio: This is the amount of space you use for every guest room you occupy. And it’s by far the most important metric a meeting hotel uses to determine how much LOVE they can give a customer. You should always ask up-front for each hotel’s ratio. In order to get the best possible deal from a hotel, your meeting space should stay within the hotel’s space-to-rooms ratio. When hotels decline RFPs, it’s not personal – it’s likely a space issue. So what can you do? Simple tip #1: Know your own meeting’s space-to-rooms ratio. 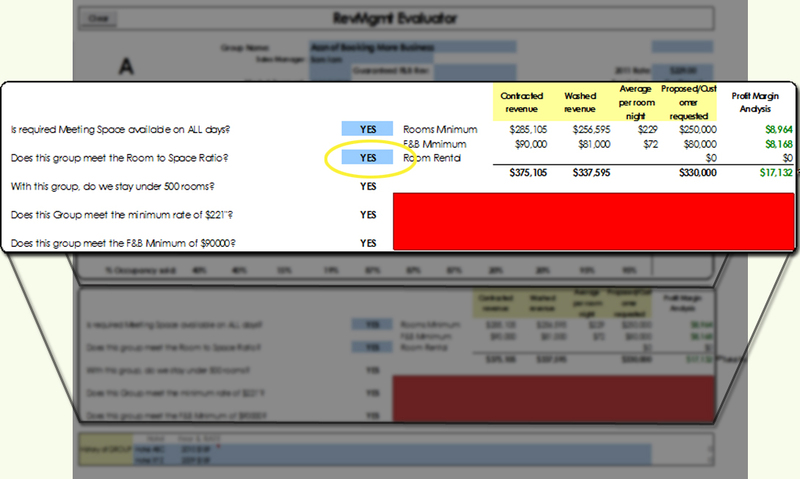 Space-to-rooms ratio = (The total number of seats in all meeting room set-ups by day X 25) / Sleeping room block by day. You’ll notice a couple of things here. First, your arrival day is way under (25 sq.ft/guest room) because you’re occupying sleeping rooms but haven’t begun to meet. Your checkout day, however, is very high (5,000 sq.ft/guest room). This is a naturally occurring event with most meetings, but it’s here – around the edges of the meeting – that hotels have the greatest exposure and work the hardest to reduce the space given. Simple tip #2: Focus on minimizing the Ratio on your pre and post days to get better deals. Hotels rarely struggle with the space ratio during the main days of your program; it’s the pre and post days that will often kill the LOVE. So, what can you do to keep the fire going? Here are some ideas on saving hotel space that have little or no impact on your overall meeting results but have huge impacts on your ratio. Keep your set-up to the first day of arrival. If you set up prior to when your room block starts, say Saturday for a Sunday arrival, you’ll lower your chances dramatically in finding availability and the right deal. Reuse your main meeting room for one of your break-outs and dinners: Hotels would rather turn a room set-up than use an additional room. With the example above, your space-to-rooms ratio drops from 101 sqft/room to 67 sqft/room – a 34% decrease in space usage, without really affecting your meeting. On the last day, ask if there is alternate space you can use for breakouts: Most hotels have restaurants, suites, other areas that would work fine for your last half day of meetings. If you’re willing to do it, the hotel will show their love in $$$ of savings. When it comes down to it, meeting hotels are more concerned about managing meeting space; after all, they rarely run out of sleeping rooms before they run out of space. Knowing how your meeting affects their meeting space inventory and more importantly, what you can do to help them sell more space, will make every hotel fall in love with you. And in this case, it’s more than just roses and a nice dinner you’ll get: With the right space-to-rooms ratio you’ll be able to negotiate one hot deal. Who said money can’t buy you love?